Did Kat Von D's Brand Post a Promo Featuring Cotton Fields? Get Your Girl: Did Kat Von D’s Beauty Brand Repost a Promo Referencing ‘Hard Work’ and a Cotton Field? 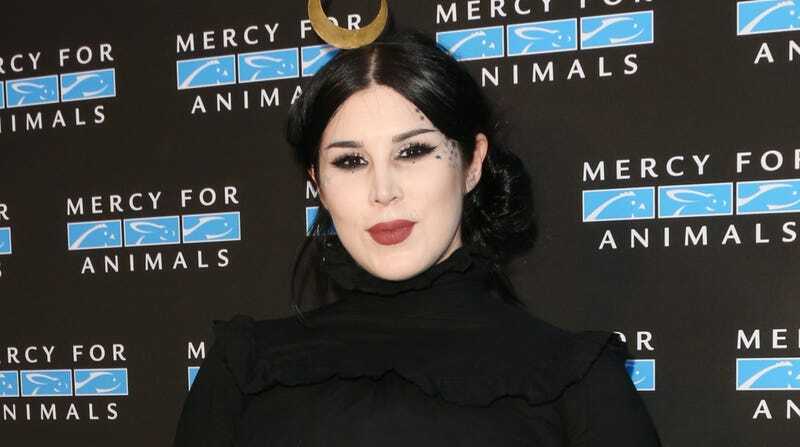 TV Personality Kat Von D attends the Mercy For Animals Presents Hidden Heroes Gala 2018 on Sept. 15, 2018 in Los Angeles, California. We’re not sure what in the pasty-faced hell someone on makeup mogul and former reality star Kat Von D’s social media team was thinking if and when they reposted an image of a cotton field to promote her Lock-It concealer, but it’s reportedly a real thing that happened—and if so, we have questions. Aside from the deeply offensive pairing of the visual and caption, the post then had the nerve to end with a brown-skinned strong-armed emoji—which is where the outrage began. Reddit users instantly jumped into a discussion about the veracity of the ad, which multiple users claim to have seen before its deletion, as did Twitter and YouTube users, who responded with disgust. And since the image was purportedly posted by Von D’s beauty brand and not the tattoo artist-turned-makeup maven herself, all of this could easily be considered a hoax, if not for Von D’s own reportedly complicated relationship with race, which includes former accusations of anti-Semitism and a much-publicized 2016 feud with former friend and beauty vlogger Jeffree Starr, in which she cited racism as a reason for the split (just a few years after ending her engagement to alleged racist and fellow former reality star Jesse James). She’s also reportedly an anti-vaxxer, but that might just mean she hates humanity on the whole. But back to the post: We reached out to Von D’s team on Thursday for comment (via two methods), but as of press time, received no response, other than the assurance that our inquiry was being forwarded to the right department. However, we’d be lying if we said that the silence itself didn’t speak volumes. So, was this purported incident a successful, if inflammatory, publicity stunt by Von D’s brand, or an incident of fraudulence by her haters? Since neither the brand nor its namesake has bothered to respond, we have no idea; but it’s not a good look (which is too bad, because that foundation and concealer were kind of bomb).